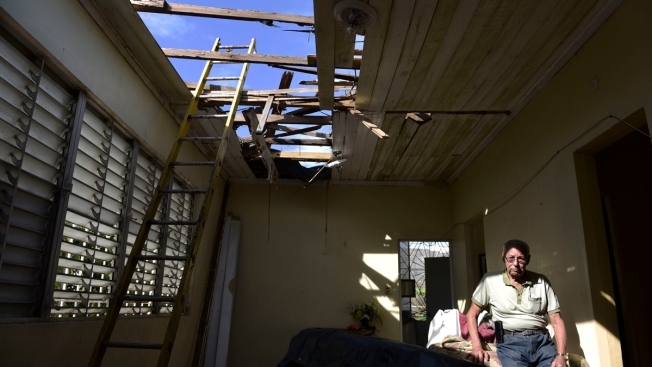 In this Nov. 15, 2017 photo, Edgardo de León sits in his living room with a hole in the ceiling caused by the whip of hurricane Maria, in Cataño, Puerto Rico. Union leaders representing Puerto Rico power company workers slammed local and federal officials on Friday as the U.S. territory missed a deadline to restore 95 percent of power as promised by the island's governor. Puerto Rico is currently at 64 percent power generation nearly three months after Hurricane Maria hit, and the situation has sparked a growing number of protests organized by some of the hundreds of neighborhoods that remain in the dark. UTIER union president Angel Figueroa said one of the biggest problems is that workers with Puerto Rico's Electric Power Authority still don't have the equipment or material to meet the governor's goal. 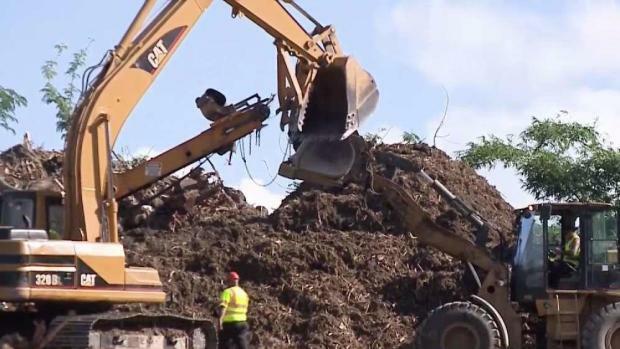 "We've been forced to recycle materials," he said, adding that residents in the southern mountain town of Villalba recently bought basic supplies for government workers so power could be restored in their neighborhood. "They used money out of their own pockets," he said. Nine of Puerto Rico's 78 municipalities remain entirely without power, and thousands of businesses have closed. The lack of electricity and other ongoing problems have sparked an exodus to the U.S. mainland, with more than 130,000 Puerto Ricans fleeing the island. Jose Sanchez, director of Puerto Rico's power grid restoration program for the U.S. Army Corps of Engineers, recently told The Associated Press that efforts to restore power have been delayed in part because supplies are lacking. "That flow of materials and personnel has to match, and they have to match perfectly," he said. "Unfortunately, I don't think anybody was prepared here in Puerto Rico to address that magnitude of destruction and be able to administer the logistics associated with that." Sanchez also said that Puerto Rico's mountainous topography poses a big challenge: "It's still a logistical nightmare." But union leaders criticized private brigades, saying they were taking too long to help restore power and questioning the multimillion dollar contracts they have obtained from the U.S. government. Last week, the U.S. Army Corps of Engineers announced it was increasing one of two contracts with Texas-based Fluor Corporation from $240 million to $505 million. The amount surpasses a highly criticized $300 million contract awarded to Montana-based Whitefish that Puerto Rico's government scrapped in late October. The small power company based in the hometown of Interior Secretary Ryan Zinke had only two full-time employees when the storm hit, and the contract is being audited at a local and federal level. Sanchez said in a statement that the updated contracts with Fluor will help provide more manpower, equipment and technical expertise. "Our goal is to help (Puerto Rico's power company) return electricity to homes and businesses as quickly as possible, and this additional funding for this contract is a significant step in meeting that goal," he said. Justo Gonzalez, the power company's interim director, told reporters Friday that he hopes to have at least one region in each of Puerto Rico's 78 municipalities lit up before Christmas. He spoke just hours before one group of neighbors prepared to march with lanterns near the capital of San Juan to demand electricity. "They've been patient, but they don't want patience to be confused with complacency," said group spokeswoman Ginette Pales.